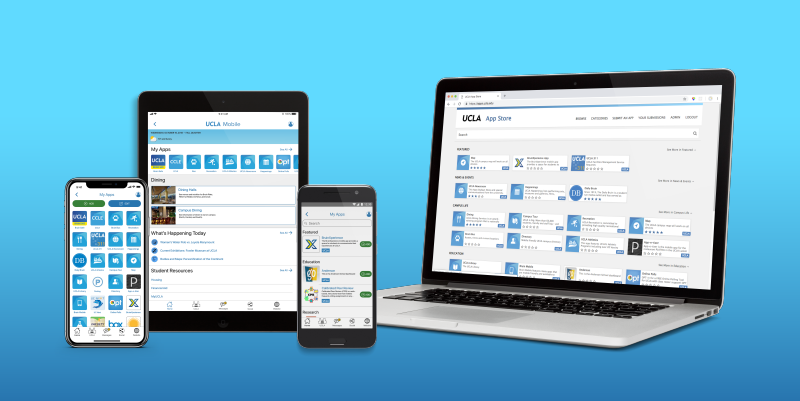 UCLA Mobile is a collaborative effort that allows the UCLA Community to customize their own UCLA App dashboard with the UCLA apps that are most important to them. It features a searchable app catalog that allows users to find the apps that they care about, like CCLE Mobile and the Box app. The latest new feature is UCLA Mobile Messaging, an opt in set of channels for Students, Staff, Faculty, Visitors and Alumni. UCLA Mobile is available on the iOS store as well as the Google Play Store. The UCLA Mobile collaborative effort is governed by a campus wide group of stakeholders comprising the UCLA Mobile Steering Committee. The purpose of the UCLA Mobile Steering Committee is to guide, govern and prioritize the ever evolving campus cross platform UCLA Mobile app dashboard as well as it’s adjacent cross platform UCLA App Store is a catalog and is available open source to interested institutions. The UCLA App store is eco-system of campus mobile friendly tools that can be shared with other institutions across the UC system and beyond.